Here is a photograph of James Sharp. This is another of the photographs I have that I wish to make available to others. James Sharp was born 7 January 1840 in Misson, Nottinghamshire, England to Thomas Sharp and Elizabeth Cartwright. I wrote about his parents, the family’s conversion to the LDS faith, and the trip to America in his brother’s short biography, Sharp-Bailey Wedding. Siblings William and Isabella continued west with a LDS wagon train and James stayed behind with his sister Elizabeth in St Louis. (Read more about Elizabeth here.) James and Elizabeth did not join the LDS faith with their mother (Elizabeth), William, and Isabella. James married Eudora Elvira Mann 3 March 1863 in Nashville, Davidson, Tennessee. Eudora “Dora” was born 1 May 1845 in Nashville. We do not know much of the life story, so how he met Dora and married her in Nashville we may never know. The two made their home in St. Louis though. James worked as a pork packer and initially started out in business with Patrick Muldoon around 1870. Here is the run down of the St. Louis directories. 1869 [FHL #980635] James Sharp with Muldoon and Sharp at 1612 Biddle. 1870 [Gould’s p. 797] shows the same. 1875 [p. 1171] Muldoon and Sharp, Pork Packers and Provision Dealers, 904 B’way. 1887, James C. Sharp is listed as a clerk at Muldoon and Sharp. 1888 is Sharp, James and Co., same address, te no. 2208. 1890 James Sharp and Co. now includes Sharp, James C. as cashier and Sharp,George as Clerk. All 3 at 3641 Finney Ave.
1895 Shows both James Sharp and James C. Sharp as packers, George W. Sharp as Manager and William M. Sharp as Clerk at James Sharp and Co., 904 S 2d. James C. now resides at 4354 Morgan, the other 3 still at 3641 Finney. 1896 and 1897 now show William M. as manager and George W. as supt. ; James and James C. simply identifed as with Co.1898 directory is missing. 1899 Company not listed. James C. (same address) is broker; George W. is just listed, at 1811 Laflin; William M. and James are just listed, still living at 3641 Finney. 1900 James C. at Sharp and Westcott; George W., clerk at Manewal Lange Bakery, 3204 Morgan; William M. litho.,at home. 1902 James C. mngr. Sharp Mnfg Co., 411 Fullerton bldg., r. 736 Bayard av;.George W. and William M. are both clerks, rresiding at 3156 Easton av. 1903 James still at 4573 Page boulevard; James C., ins., 721 Olive, r. 3732 Washington boul. As you can probably tell from the information above, James put his children to work and included them in the business. James retired at 55 and turned the business over to his boys. By 1898 they had run the business in the ground, supposedly because of their like for being horsey (horse-racing). James and Dora had 5 children. Eudora Mann Sharp born 13 January 1864 and died 11 January 1938, both in St. Louis. She married Alexander A Bryden, who worked in the coal business. Ida Lee Sharp born 8 October 1866 and died 23 December 1946, both in St. Louis. She was unmarried. She worked as a school teacher. James Carlisle Sharp born 26 December 1868 in St. Louis and died 4 November 1952 in Valley Park, St. Louis, Missouri. He married Emma Manewal (and divorced) and Madeline C Grimm. He had a department store. Emma was the daughter of August Manewal, one of the confederation of bakers who formed the National Biscuit Company (NABISCO). George W Sharp born 10 March 1871 in St. Louis and died in 1964 in Sand Springs, Tulsa, Oklahoma. Apparently he married a lady named Effie Olive, but we know nothing more about his life or her. He was badly disfigured after being kicked in the head by a horse at 3 years old. William Muldoon Sharp born 4 October 1874 and died 24 March 1915, both in St. Louis. He also remained unmarried. Eudora died 3 March 1894 of cerebral meningitis. She was listed as living at 3641 Finney Avenue. She was buried in the Bellefontaine Cemetery 5 March 1894. James died at 68 years old on 24 February 1908 at the Bryden residence at 4573 Page Boulevard. He fell from a Page Avenue car (assuming trolley car) according to his obituary. He was on his way home from a lodge meeting when he stepped from a car in motion. He was injured in the fall on the 22nd, not clear how, and died on the 24th. He was a founder of St. George’s society and served as a treasurer for several year. He was also a member of the Merchants’ Exchange and a veteran member of the St. Louis Lodge No. 5, I.O.O.F. He was buried on the 24th, also at Bellefontaine Cemetery. 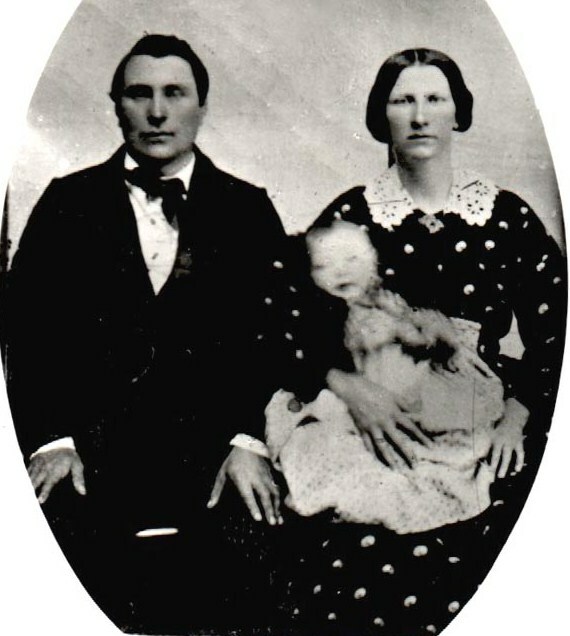 Here is a photograph of John Quayle and Elizabeth Sharp and presumably one of their children. Since I have the photograph, I thought I better make it available. Elizabeth Sharp was born on Christmas Day in 1834 in Misson, Nottinghamshire, England to Thomas Sharp and Elizabeth Cartwright. If you are interested, I have written about her parents, the family’s conversion to the LDS faith, and the family’s trip to America in her brother’s short biography, Sharp-Bailey Wedding. Siblings William and Isabella continued west with a LDS wagon train and Elizabeth stayed behind with her brother James in St Louis. Elizabeth’s mother died in St. Louis shortly after arriving. Elizabeth and James did not join the LDS faith with their mother (Elizabeth), William, and Isabella. Elizabeth married John Quayle who was a shoemaker and born 14 March 1833 in Kirkham, Isle of Man. I have not been able to find this town, so either it is a mistake or misspelling. The 1860 Census has the family living in Meramec, St Louis, Missouri. 1870 places them in Central, St Louis, Missouri. 1880 finally places the family back in St Louis, Missouri, where both of them died. By the 1880 Census, John had become a foreman in a pork house, probably the pork house of his brother-in-law James. I have a photo of James and his short biography will be available soon. The family seemed to have some difficulty informing the census takers because their ages jump pretty wildly from the right year to up to nine years in difference. Further, John Quayle is listed as Isle of Man in one, Wales in another, and even Missouri in another. We are pretty confident in the date given above, but it is not perfectly sure. John and Elizabeth have seven children that we are aware of, some believe there is another named Thomas but we cannot link him with any clear documentation. John Quayle (Jr) was born 5 November 1855 in Illinois and died 13 May 1910 in St. Louis. He was buried on the 15th in the New St. Marcus Cemetery in St. Louis. He married Laura Breitenstein 19 June 1833 in St. Louis. 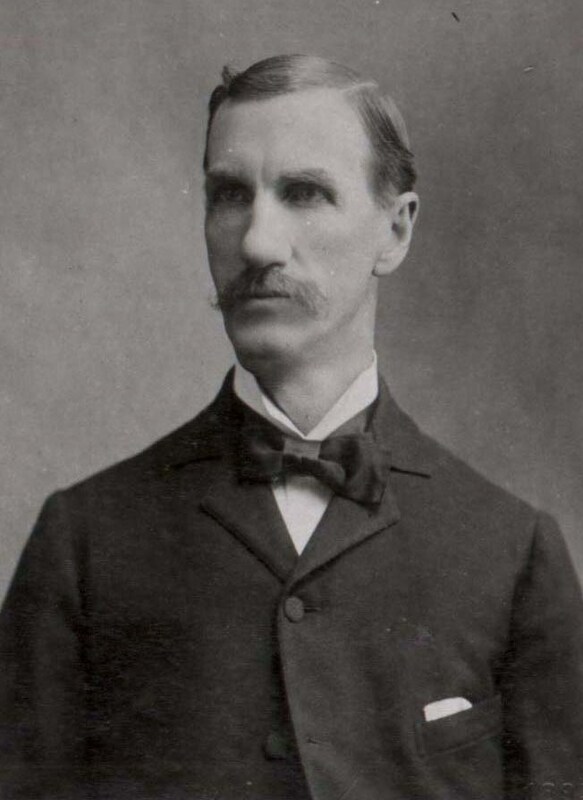 James H Quayle was born 15 February 1858 in St. Louis and 6 September 1864 in St. Louis. He is buried in the Bellefontaine Cemetery in St. Louis. Isabella Quayle was born October 1861 in St. Louis and died 12 September 1864 in St. Louis. She is also buried in Bellefontaine Cemetery. Margaret Quayle was born July 1864 in St. Louis and died 25 April 1866 in St. Louis. She is also buried in Bellefontaine Cemetery. Ida Quayle was born in 1867 and died 13 November 1888. We do not know much more. Emily Quayle, also apparently called Emma on some records, was born 29 January 1868 in St. Louis and died 1 February 1928 in St. Louis. She was buried on the 3rd in St. Marcus Cemetery. She married Gustavus Crause. Elizabeth Quayle was born December 1870. She married William Duggan. We do not know much else about this family besides this little bit shared with family near the early 1900’s. She died 25 June 1903 in St. Louis. In 1878 the family lived at 1286 S 8th St in St Louis. In 1880 they were living at 1727 Decatur in St. Louis. John died in 1894 after falling off a load of hay. We do not know much more than this and it does not appear he is buried with the rest of the family in Bellefontaine Cemetery, if so, it is misspelled or under another name. Elizabeth lived with her daughter Elizabeth, known as Lizzie to differentiate, until her passing. Elizabeth died of typhoid fever 6 November 1902 in St. Louis. She was buried the next day in Bellefontaine.